ntietz wrote: How do you all prepare white tea? I followed the instructions for the Snow Bud sample, but the high end of the time: 5 minutes at about 190° F. It turned out tasty, but it is almost completely clear. I know Snow Bud is supposed to be particularly light -- is it supposed to be this clear, though? I can't see really any color in it right now. Now you know why it's called "white tea". I had never tried darjeeling tea before recently watching Spellbound and, on a whim, picking up some Twinnings bagged from the grocery store. My mother in-law favors black teas on the mild end of the spectrum, so I figured if we didn't like it, she'd drink it. But turns out, it agrees with me quite a bit. I feel like it has a lot of the qualities I like about green teas, without some of the qualities I don't like about black teas, but retaining the taste of a black tea which is something I like just fine. The package recommends taking it with a splash of milk, but I think it's fine black or with just a hint of sugar. I've never like dairy in tea, though; my opinion is only strengthened by learning that milk binds up a lot of the antioxidants in tea and coffee, making them unavailable. Yeah, I've always thought of Darjeeling as one of those teas that doesn't take milk. But it does get pretty astringent pretty quickly if brewed too long. Assam, on the other hand, benefits from a generous splash of milk. It's a little surprising, given how close Darjeeling is to Assam. Wikipedia tells me that they're grown at different altitudes. dubsola wrote: I had a cup of tea from Starbucks at JFK airport recently, and it was actually very, very good. I was pleasantly surprised. I was hanging out at Starbucks for a while this summer because I needed WiFi. I'm not big on coffee (especially not Starbucks coffee) but I was also pleasantly surprised by their iced tea, especially sweetened. Now I like traditional sweet tea as much as the next person (where "traditional sweet tea" = "find out how much sugar could possibly be suspended in the tea, then double the amount"), but their sweet tea is sweet w/out being overpowering. And if you have a registered Starbucks card, iced tea refills are free, which makes standard Starbucks prices more affordable. I liked it enough that I started making my own sweet-but-not-overpowering tea at home. Even got a couple of our kids hooked on it. I think Starbucks tea is generally not too bad because Tazo tea is pretty all right, especially in the nice full-leaf bags they use at the cafes. I'm normally not a fan, but I work right next to Starbucks and I have come to accept that their earl grey tea with steamed milk is pretty much the ultimate mood improver for freezing November afternoons. Less corporately, anyone familiar with Twig Tea? I've tried it a few times at a place near my house, but never seen it for sale anywhere nor heard much about it all. It tastes exactly like it sounds, in my opinion, but in the good kind of grassy way. kellsbells wrote: Less corporately, anyone familiar with Twig Tea? I've tried it a few times at a place near my house, but never seen it for sale anywhere nor heard much about it all. It tastes exactly like it sounds, in my opinion, but in the good kind of grassy way. Yes. You can get it from http://www.specialteas.com. I had all manner of trouble explaining to Australian quarantine that IT'S JUST FREAKING TEA IT COMES FROM THE SAME DAMN PLANT. *ahem* Anyway, the one I had was roasted kukicha, and tasted quite "toasty", a little like genmaicha (puffed rice tea). Although I'm mostly a black tea drinker, I happened to stop by a Japanese supermarket yesterday and picked up a couple of packets of loose sencha. I got one a packet of Yamamotoyama and another of Maeda-en, planning to do a taste test to compare them, but I realized that I accidentally picked up their premium 'gold' brand Maeda-en, so it wouldn't be a fair comparison. I gave the Yamamotoyama a try today at work. I didn't use boiling water, but I think it was still too hot, making a mediocre cup of tea. I used a thermometer for the second infusion, and it was better (but, you know, a second infusion). I'll give the Maeda-en a try tomorrow. The leaves are visibly bigger, with fewer powdery bits. The think that struck me the most, being a CTC black tea drinker, was how visually appealing brewed green tea leaves are. They also had twig tea, but I didn't pick any up. EDIT: Tried the Maeda-en gold. I now understand why it's so much more expensive. of course, this is my tea kit http://imgur.com/760vy . I'm not much of a snob since i've found i can't really tell between good tea and really good tea (bad tea is easy to pick out though), but I do love me some peppermint tea. Speaking of which, have any of you had jasmine tea, with white chocolate? it's a heavenly combination. Last edited by Robot_Raptor on Fri May 13, 2011 9:04 pm UTC, edited 1 time in total. Robot_Raptor wrote: Speaking of which, have any of you had jasmine tea, with white chocolate? it's a heavenly combination. I *may* have. I've definitely had jasmine green tea with stroopwafel cookies. Delicious to have a delicate tea with a delicate sweet. I was recently in India, where I had some of the best tea I have ever had. Most of it was some sort of masala milk tea. Unfortunately, I haven't managed to get the masala chai I brought home with me to live up to the tea I had there, so I've been mostly drinking green tea recently. As for herbal "tea", I quite enjoy a cup of peppermint tea in the evening. I HAVE TEA! From an actual tea shop! Look! I whinged a bit on page 4ish about being allergic to all tea (black, green, herbal, rooibos...). I never did get around to trying the barley or almond based ideas that were suggested, but I did just recently find a place that sells what amounts to a pure fruit-and-nut tea. No leaves, just almonds, apples, cinnamon bark, and beets. The smell is apple-cinnamon-almond, though the taste is mostly beets. Now that I'm used to that, and have largely figured out how to steep it effectively without getting a cup full of fruitnutbits, it's my favourite afternoon beverage at work. I can have hot non-coffee things again! Yes! I still don't understand how you can be allergic to herbal tea as a whole, because each herbal tea is totally different plants! Does this mean that you are allergic to mint, chamomile, rosehips, hibiscus etc.? ...Are you allergic to chlorophyll? Y'know, I've wondered that myself. I can add, say, basil or mint leaves to things I'm cooking, but if I steep them into a tea, I get an allergic reaction. Maybe things get more concentrated as tea? Maybe having other food around to dilute the effect of the leaves is why I'm not bothered by food with mint? I don't get it. At least the allergies seem to be easing off a little. (Yay, tomatoes are back! 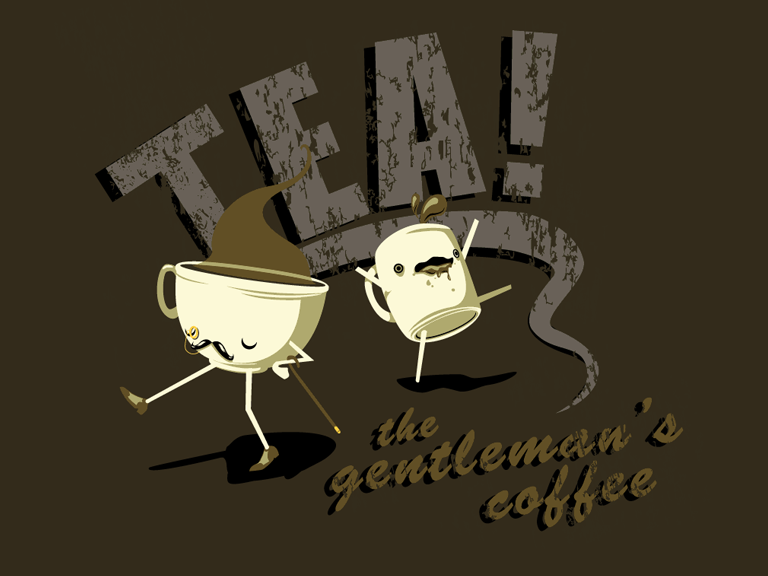 They don't make good tea, though.) People with oral allergy syndrome are sometimes known to "grow out of it" in their 40s or 50s, so I can hope. How about chocolate? I've heard good things about cacao-based tisanes; this sort of thing. I hadn't heard of the tea, but I did learn about Choffy a while back. It's a coffee-type drink made from cacao beans. I think I didn't order any because of online complications, or something. I'll see what ordering from the tea site involves. Theoretically, I'm mildly allergic to chocolate as well. I don't notice a reaction to it, but I do notice an aversion after I've had some. I'll eat some yummy chocolate and enjoy it very much, then I just won't want any for a week or more afterward. The darker the choccy, the longer it takes before the aversion wears off. Nath wrote: Yeah, I've always thought of Darjeeling as one of those teas that doesn't take milk. But it does get pretty astringent pretty quickly if brewed too long. Yep, Darjeeling tea is better without milk. It's a little bland for me, I prefer Assam. I actually visited Darjeeling, and you can just about throw a stone off the hills of Darjeeling and have it land in Assam. 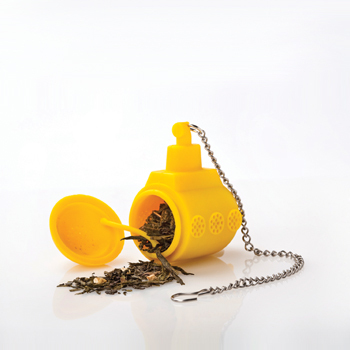 Tea drinkers, what is the best tea infuser thing to use. I have a few tea pots already, so I don't want to buy another pot with a built in infuser, I just want a little cage for my tea. I am thinking something like this. dubsola wrote: Tea drinkers, what is the best tea infuser thing to use. I have a few tea pots already, so I don't want to buy another pot with a built in infuser, I just want a little cage for my tea. I am thinking something like this. I recommend against the mesh balls -- they never let tea leaves expand, leak at the seams, and result in less taste. Hmm, I see what you mean, and that device would work well with fine teas, but the question is - would that fit into a small teapot? dubsola wrote: Hmm, I see what you mean, and that device would work well with fine teas, but the question is - would that fit into a small teapot? There is a Finum large basket available that might do the trick. I've been using a Finum basket for the past year or so, and it's by far my favorite way to brew tea. I brew directly in the mug, but it should work fine with a small pot. I want to get to a place where I don't have to throw anything away over the course of a day. Certainly, those little bags look pretty great, and they're not especially bad for the environment, so they're not off the table, but I think I'll get the basket to start with. Nath do you know what size you have? dubsola wrote: I want to get to a place where I don't have to throw anything away over the course of a day. Certainly, those little bags look pretty great, and they're not especially bad for the environment, so they're not off the table, but I think I'll get the basket to start with. Nath do you know what size you have? I NEED THIS THING IMMEDIATELY. Today, I discovered that Assam tea goes well with chili powder, powdered cloves, and nutmeg in a 1:3 milk to water mix, as well as a modest amount of sugar. I do believe that my mother was appropriately horrified when I told her about it. Why was your mother horrified by masala chai? Nath wrote: Why was your mother horrified by masala chai? Because of the chili powder - she's fine with the other stuff, and suggested that I add cardamom and ginger instead. I wish masala chai was readily available on the streets of London, especially this time of year. Brr! raike wrote: Today, I discovered that Assam tea goes well with chili powder, powdered cloves, and nutmeg in a 1:3 milk to water mix, as well as a modest amount of sugar. I do believe that my mother was appropriately horrified when I told her about it. I have a similar problem with my tea robot, but it's too awesome not to use. She said, having used it for the first time a mere 30 minutes ago. which I thought was cool (although the robot is cooler), looks pretty easy to get the tea leaves into though. I'd tried chillies in chocolate before (both in beverage and solid form), but I'd never thought to try it in tea. Black pepper, sure, but not chillies. Right now I'm drinking Taj Mahal Assam tea, brewed with a couple of crushed cardamom pods, a couple of cloves, and some red chilli flakes. Splash of milk. I should have tried this a week ago while I still had a cold. 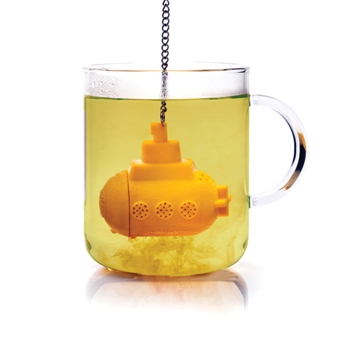 On the subject of tea submersibles, as cool as that yellow submarine looks, it seems too small and enclosed to let the tea expand and mingle with the water. Also, that metal chain may affect the taste of the tea. Nath wrote: Yeah, I've always thought of Darjeeling as one of those teas that doesn't take milk. the tea doesn't take anything. You take milk in your tea, or you don't. Or you enjoy milk in some teas but not others, which is what the 'tea that takes milk' idiom is shorthand for. I like milk in darjeeling but I like milk in almost all black teas. Also I do not have a tea robot (although now I want one!) but I do have a tea duckie that floats happily in my water, steeping tea for me. This month I have spent too much on tea but I have both a new job and new medication that makes me sleepy all the time, and these things don't go well together. The caffeine helps combat it. I have a shiny new tea tumbler from teavana that is delightful and so I have nice hot tea all day at work but now I drink way too much tea. I think I refill it four or five times a day. Also I got this prettypretty castiron teapot because it was on sale and I have never seen them on sale before. In the DC area, I've recently found two tea stores of note -- one good, one bad. They have several locations in this area (at least one in Georgetown and one in Alexandria) and several others across the country (link). The quality of much of the tea they have is great -- my favorites are the ones infused with chocolate and the genmaicha that they have (naturally, like any other place, there're a few blends that aren't good so at least sniff before you buy). The prices are a bit on the high side, but generally not as bad as Teavana. This place is crap. I don't understand how they stay in business and operate like 6-7 locations. It's overpriced, their blends smell like someone went way overboard with every spice on the rack, and everything else is simply the same as you could get elsewhere for a lower price. I think you'd be better off brewing potpourri.